Haiti for Christ Ministries is a 501(c)3 nonprofit organization run for more than 40 years by missionaries Joel and Yvonne Trimble. The Trimbles are independent missionaries not affiliated with any denomination or mission board. God has called the Trimbles into a unique relationship with the precious people of Haiti, a country they have been proud to call home since 1975. 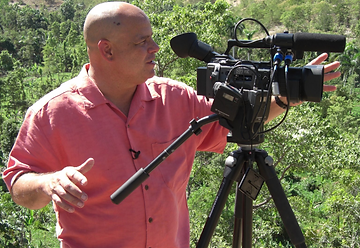 Haiti for Christ also produces the number one television show in Haiti, La Bonne Nouvelle, bringing the good news of Christ to Haitians both in Haiti and around the world. Joel and Yvonne Trimble were married on December 9, 1977. They had known each other for ten weeks. By March of 1978 they were living on the mission field in Port au Prince, Haiti. As non-denominated, missionaries Joel and Yvonne often worked to support the ministry. Joel would rise early to do a live radio show in Creole. Evenings he was often asked to act as interpreter for Americans visiting Haiti. Translation occasionally generated donations from visiting evangelists. For the first five years of ministry, Joel and Yvonne lived in a house with no running water. Their second son, Paul, was born in that house at 28 Ruelle Lily. The Trimbles had no personal vehicle until a team from Whitesburg Baptist Church, Huntsville, Alabama raised the funds to purchase a new Isuzu jeep. By 1981 Joel and Yvonne lead evangelism team that traveled to villages with a flatbed truck loaded with sound equipment, courtesy of David Wilkersons World Challenge. Joel, the evangelist, would preach open-air services and show the Jesus movie in Creole, courtesy of Bill Bright’s Campus Crusade for Christ. Joel explained that he preached the gospel four times a day on a local voodoo station and was a traveling evangelist. Danny encouraged Joel to open a church featuring nightly services. With the financial support of Pastor Roy Stockstill, Bethany Baptist Church in Baton Rouge, La, Joel did and the Center of Faith, Hope and Love were born. In 1987 the Center of Faith had grown to over 5,000 members worshiping under a large tent on government land. 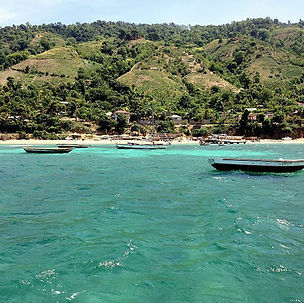 When the Duvalier government was deposed the Center of the Faith was forced to relinquish their land. With nowhere to go, the church closed, but the ministry to Haiti continued. 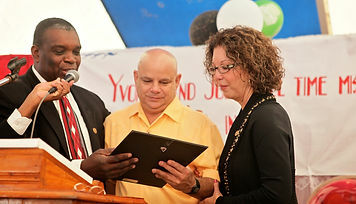 Today Joel & Yvonne Trimble produce La Bonne Nouvelle, Haiti’s most popular television show. Hundreds of thousands of viewers both in Haiti and around the world have heard the good news of Christ in the Kreyol language. 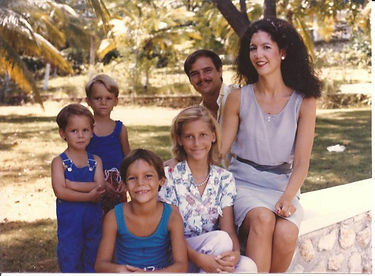 Four children, six grandchildren and decades later, evangelism in the US and Haiti, and Creole television broadcasts in the US and Haiti comprise Haiti for Christ ministries. On His Path has worked in El Salvador for three years with vulnerable children and families in the clubfoot program. The goal of the program is to give children the opportunity to live an active lifestyle and to play, run and kick a ball and be active members in their communities, as well as responding to Jesus’ example of healing the sick and his call to share the gospel. On His Path is working for those whose physical disabilities can be corrected or alleviated through medical treatment. In our ve clinics around the country, we are providing training to doctors, the materials and braces for non-surgical treatment for children born with clubfoot by partnering with local public health care system so mothers and fathers do not worry that their children will never walk and give them the opportunity to celebrate their rst steps. In the year 2015, we want to trust God to ful ll his promise as stated in Isaiah 43:19: He will bless us with new opportunities, provision and direction in our organization as we continue looking for opportunities to expand our collaboration to make clubfoot treatment accessible to more children. Our goal is to help establish at least one more strategically located clinic across the country. This year, we will sponsor at least one medical training; our goal is to support the treatment of at least 175 children born this year with clubfoot in El Salvador. We will continue working with responsibility and integrity of the Ponseti Method to serve more children with high quality care and reach as many children as possible with the promotion of the program. We are immensely grateful to the Lord for allowing us to serve the little ones in our country and all the generous donors who make the program possible and for joining us in our dream to eradicate untreated clubfoot in El Salvador.